This post follows on from part 4, but this time we’ll be configuring a Layer-2 Ethernet to Ethernet MPLS VPN between the 2 CEs. I’m going to configure a Martini Layer 2 VPN. Martini uses LDP to signal and setup the VPN across the MPLS network. With MPLS L2 VPNs there will also be a minimum of two labels. The top label being the transport label and the bottom label being the VC label. The transport label will be swapped hop by hop through the MPLS network. The VC label is used by the egress PE router to identify the Virtual Cirtcuit that the incoming packet relates to. On an Ethernet segment, the frame would look like this for a payload of 1500 bytes. L2 Header – 14 bytes. This is the Ethernet header for the frame. 14 bytes, or 18 bytes if the interface is an 802.1q trunk. MPLS Label – 4 bytes. The transport label. VC Label – 4 bytes. The VC ID. Control Word – 4 bytes. This is an optional field only required when transporting FR or ATM, carrying additional L2 protocol information. L2 Data – 1514 – 1518 bytes. The encapsulated Layer-2 frame that is being transmitted across the MPLS network. In this case 1500 bytes of data, plus the L2 header (an additional 4 bytes would be added if the VPN interface is a trunk). Well this means that we will be putting a minimum of 1540 bytes (14 +4+4 + 4+1514) of data on the wire if there was 1500 bytes of customer data in the encapsulated L2 frame. If the customer interface is a trunk and the SP interface is a trunk, then we are up to 1548 bytes on the wire across the P network. For this lab, I’ll be using the topology below. The base configurations are using OSPF as the routing protocol and LDP to exchange transport labels. The base configs are similar to part 3, using OSPF as the IGP and LDP to signal transport labels, so I’ll jump straight in to the Martini VPN config. The configuration could not be simpler. The VCID must match at both sides and is set to 12. Not much to it on Junos either. Notice that I enable LDP on the loopback. The obvious difference compared to L3 MPLS VPN is that the provider network has no involvement in customer routing. What’s the maximum ping we can get from CE1 to CE2? The provider core is set to 1500 bytes on the PE-P-PE interfaces. It should be 1474 right? 1500 – 14 bytes of L2 headers – 2 labels – 1 control word. And it is. Let’s look at a capture on the PE1 facing interfaces on the P router. 1514 bytes on the wire as expected. Now how about I make the CE1-CE2 link dot1q. I’ve not changed anything on the PE routers, just enabled a 802.1q tagged interface using on each CE. As there will be an extra 4 bytes of overhead, the maximum ping size will drop to 1470. We can see the extra header in the packet capture – exactly where you’d expect to see it – in between the CE generated Ethernet header and IP data. Now we know how the data on the wire changes when an MPLS L2 VPN is created, it’s easy to make provision for the additional overhead across the MPLS core by increasing MTUs accordingly. Thanks for reading my post. We’ve covered both Cisco and Juniper here, but be sure to check out other posts from the #JuniperFan bloggers here. I had only intended to do 3 parts to this series, but I can’t really stop at part 3 (MPLS) without posting about how MPLS Layer 3 VPN affects MTU. In this post we’ll build a simple MPLS VPN network and our goal is to transmit 1500 bytes of IP data between the CEs. With MPLS L3 VPNs there will be two labels. The top label being the transport label and the bottom label being the VPN label. The transport label will be swapped hop by hop through the MPLS network. The VPN label is used by the egress PE router to identify the VPN/VRF that the incoming packet relates to. Assuming PHP is being used, the transport label will be removed by the router before the egress PE (in this lab the “P” router), leaving only the VPN label in the stack. As with previous posts in this series I’m going to show what needs to be done to enable the required MTU. I’ll give some commentary on the MPLS config but will save the detailed analysis of MPLS control/data plane for another time. PE2 is running Junos on Firefly in packet mode. 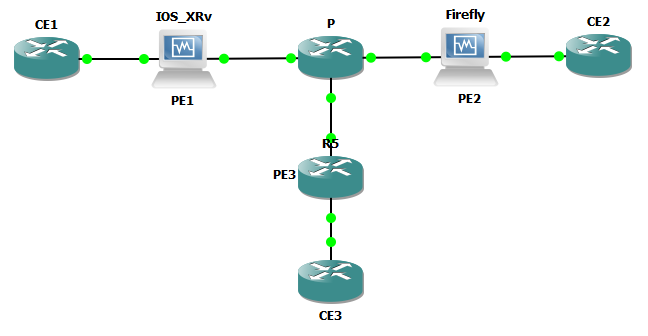 Let’s go ahead and enable the routing and VRF configuration between PE1 and CE1. We’ll use BGP as the PE-CE routing protocol. CE1. There isn’t anything special about the configuration on the CE. BGP is used as the PE-CE routing protocol and is advertising the local interfaces to PE1. PE1. All the magic happens on the PE routers. Here the VRFs are defined and we add the BGP neighbor – note that the PE-CE BGP configuration is VRF based. On XR, if I don’t configure an in/out export policy for the CE1 session then no routes will be sent/received. I’ve defined a simple policy to allow all routes to be sent/received. Here we’ll use OSPF as the PE-CE routing protocol. PE2 is running Junos and most of the configuration all happens in a routing instance stanza. The routing instance defines the VRF, the route-distinguisher and route-targets to import. All the OSPF configuration takes place here as well. I have an export policy configured so that the BGP VRF routes are exported in to OSPF and distributed onward to CE2. PE3 is running IOS. Again, OSPF is used as the PE-CE routing protocol. 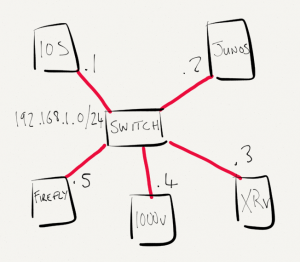 Mutual redistribution is configured between the VRF based BGP and OSPF protocols. At this point we have an any to any MPLS VPN configured between the 3 CE routers. They should have full reachability, let’s see! But at this point the MTU settings on the PE-P-PE links are all set to the default of 1500 bytes, so a 1500 byte ping isn’t going to work. OK, we are getting an ICMP unreachable back from PE1 exactly as expected. We know that MPLS VPNs adds 2 labels to the stack, and therefore adds an extra 8 bytes of overhead, so all we need to do is increase the interface MTU to allow this extra data. From previous posts in this series we know how the different software does things. 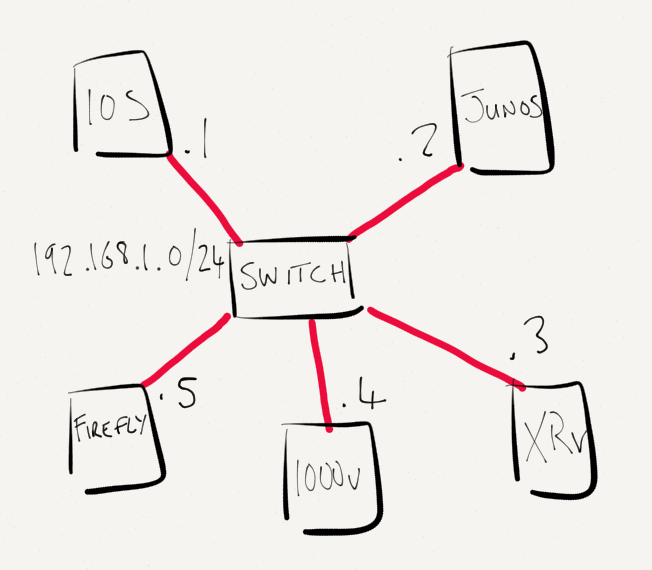 On PE1, the IOS-XR router, the interface MTU will be increased to 1522 (1514 + 8), and the MPLS MTU will be set to 1508. On P, the interface MTU will be increased to 1508 and the MPLS MTU will be set to 1508. The same config will be required on PE3 as both are running IOS. On PE2, the Junos router, the interface MTU will be increased to 1522 (1514 + 8), and the MPLS MTU will be set to 1508. In this simple lab we configured an any to any MPLS VPN and verified the settings required for a 1500 bytes of payload to be transmitted across our MPLS VPN network. In a later post I will come back to this topology and go through the MPLS configuration in more detail. There will also be a part 5 which will cover MPLS L2 VPN (pseudowire). This week I took the CCDE written to recertify my CCIEs. That chalks up 8 years now of being a CCIE. Firstly, why did I recert? Ethan Banks recently wrote a great post “Is the CCIE Certification Losing value?” in which Ethan talks about his upcoming re-certification deadline, and if he’ll take the exam or not. It took a shed load of time and effort to become a dual CCIE. So much went in to achieving the R&S and SP, I’m not ready to let them go just yet. In comparison to the actual lab, the written is a fairly simple way to keep the certs alive. I don’t necessarily agree with being able to recertify any CCIE by taking a single expert level exam, but as I don’t have much spare time, it sure makes life easier! Having the CCIE is a meaningful and simple way for clients to gauge my skill level, to a point of course. As with many CCIEs, my experience extends way beyond working on the CLI (which is one of the reasons I originally became interested in the CCDE). In my opinion, the CCIE is valuable and isn’t going away any time soon. Whilst it has a place I’ll aim to keep the badges. Now on to the exam itself. I took the CCDE v1 written exam at the last recert, I thought I might take the CCDE practical. I still might, who knows, but this time I wanted to check out the v2 exam. The 1st thing to note about the exam blueprint is that it’s huge. You can be tested on pretty much anything – networking, wireless, datacentre, standards, process, etc. There is no formal training requirement for this exam, just a load of books to read. Check out the list. Over the years I’ve read most of the books on this list already cover to cover. Some more than once! Having a Safari books subscription is a great investment. If you don’t have access, I’d recommend it – particularly whilst you are working up to taking an exam. This time around I re-read my notes from last time, picked out the sections from the blueprint that I wanted to improve on, and went to town on the book list, CCO etc. The exam itself is quite challenging – it is very different to other Cisco exams that I’ve taken in the past. Whilst it might not always go in to the depth and nuts and bolts that you’d see right the way though for example, the CCIE SP written, there’s a lot to the questions and you need to be prepared to take time to think clearly through several different designs, technologies & concepts before finding the best answer and clicking that next button. Overall I enjoyed the exam, and that’s the CCIE re-certification done now for another 2 years. Next time around it will be 10 years! That’s flown by. If you are taking the CCIE or CCDE exams right now, or any vendor expert level certification for that matter, best of luck with the journey. It’s hard work, but most importantly make sure you enjoy the ride! Part 1 of this series focussed on the interface MTU configuration, looking how different vendors implement the setting. Some include the layer 2 headers, some don’t. Part 2 looked at Jumbo Frames, IP MTU and OSPF. In this post we’ll build a simple 4 node MPLS network and check out how the default MTU settings affect the transmission of data. We’ll also enable a couple of 802.1q tagged interfaces. The configuration will be adjusted accordingly to enable the transmission of 2000 bytes of IP payload across the MPLS core. DEI: Drop eligible indicator. Used to indicated if frames can be dropped. VID: VLAN ID. A 12-bit field specifying the VLAN. Multiple 802.1q tags can be present in the frame. This is known as IEEE 802.1ad Q-inQ. More on this another time. Label. The label itself – 20 bits. EXP. A 3-bit field used for QoS markings. S. 1-bit to represent if a label is the last in the stack. TTL. An 8-bit time to live field. As the S bit implies, there can be a stack of labels. More on this another time. R1 is running IOS, the base configuration is as below. There is nothing special about the link from R1 to R2, the MTU is set to the default 1514, so we can expect 1500 to be the IP MTU. Notice that the link from R2 to R3 is an 802.1q tagged interface. XR has automatically increased the MTU on the 802.1q subinterface to 1518, to keep 1500 bytes available to IP. Here is the Junos configuration on R3. On the tagged interface to VLAN23, Junos has also increased the MTU to 1518 to accommodate the VLAN tag and enable 1500 bytes of protocol data. Note, if you configure the interface MTU manually or XR or Junos you’d still need to allow for the dot1q tags. [email protected]> show interfaces em0 | match "Phy|Log|MTU|Tag"
I like it how Junos includes the VLAN Tag 0x8100.23 in the output to indicate a 802.1q tag 23. The MTU will be 1514 for the Physical, and 1500 for family inet. [email protected]> show interfaces em1 | match "Phy|Log|MTU"
At this point the biggest ping that we’ll be able to get from R4 to R1’s loopback address 1.1.1.1 is going to be 1472, representing 1500 byes of IP data and 1514 on the wire (1472 data + 8 ICMP header + 20 IP header + 14 Ethernet). MPLS and will now be enabled across the topology. LSPs will be RSVP signalled and I’ll demonstrate how the MTU settings need to be updated. As this post is focussing on the approach different vendors take to MTU, I’ll skip the MPLS detail and save it for another time, but the relevant MPLS config is below. On R1 I’ve enabled a Tunnel interface and statically routed IP traffic to R4’s Loopback via this MPLS TE tunnel. LDP has not been enabled and doesn’t need to be. R2. In IOS-XR, the interfaces are added to the protocol. R3. On Junos we add the Interfaces to the protocols MPLS and RSVP and enable family mpls on the logical unit. OK, so this point we have a functioning MPLS topology with traffic from R1 to R4 (4.4.4.4) and from R4 to R1 (1.1.1.1) being label switched. The MTU settings are still at the defaults, so let’s see what the maximum size of IP payload we are able to transmit. We know that only one label is in the stack, so will the maximum be 1496? No, that maximum that could be transmitted in both directions was 1488 bytes of IP data. Don’t forget for Junos, 28 bytes of headers are added to the ping size. By default Junos derives the MPLS MTU from the Interface settings and makes allowance for 3 labels in the stack, so with a 1500 byte interface MTU, the MPLS MTU would be set to 1488. This is why we can only ping with 1488 bytes of protocol data. On both of the Junos routers I’m going to go ahead and set the Interface MTU to 9192, but since my goal is to test an MPLS switched payload of 2000 bytes IP data, I’ll set the MPLS MTU and leave the IP MTU at 1500 bytes. Note if the MPLS MTU is user configured then the configured value includes the labels. I’ll set the MPLS MTU to 2004 to allow the 2000 bytes of data and for this test I only need to make allowance for 1 label. [email protected]> show interfaces em* | match "em|proto"
I love how Junos allows a regexp to be used pretty much however I feel like using it. At this point the maximum ping size from both sides of the network is currently 1496 bytes. This is as expected because we have 1 label in the stack and the Cisco routers are still set to 1500 bytes on the Interface MTU. Let’s have a look what’s going on with the interface MTU parameters on the Ciscos. It would appear that the MPLS MTU is 1500, so straight away we can see that Cisco are including the labels in the 1500, otherwise our ping of 1500 would be working. Let’s go ahead and check this theory by increasing the Interface MTU and the MPLS MTU by 4 bytes on each Cisco. The IP MTU will remain set at 1500. RP/0/0/CPU0:R2-XRv#show im database interface GigabitEthernet0/0/0/0.23 | i "ipv4|mpls"
The 1500 byte ping now works exactly as expected. Since my goal is to get a 2000 byte label switched ping working. I’ll go ahead and set the MPLS MTU on the Ciscos for test. I’ll set this to 2004 like I did on the Junos routers. OK so now we have the capability for an MPLS LSP with 2000 bytes payload. But can I ping from R4 to R1 with my 2000 byte ping? We’re being told that the packet is too big at R2. Why’s this? Well remember that MPLS will pop the label at the hop before the destination. This is known as penultimate hop popping. So the data between R2 is and R1 is transmitted as IP, not MPLS. As I left the MTU at 1500 for IP data, the echo request cannot be transmitted. I actually did this on purpose by changing the config on R1 so that the LSPs were implicit null signalled. If I go ahead and change the signalling to explicit null, the LSP will then be labelled end to end and the ping will work. On R1 I turn off implicit-null and R4 I turn on explicit-null. Excellent! The capture below was taken on R2s interface to R1, and you can see the 2018 bytes on the wire (1972 data + 8 ICMP + 20 IP + 4 MPLS + 14 Ethernet). Notice Label 0 is used for Explicit Null on IPv4. In this post we focussed on MPLS MTU and how to use MPLS MTU to enable a payload >1500 bytes. I’ve demonstrated the the Interface MTU, MPLS MTU and IP MTU can be set to totally different values. Why does any of this matter? In a provider core you need to be able to transport your customers full size frames across your network. You can guarantee that customer data will be at least 1500 bytes, but depending on the service specification that you want to sell, could be as large as 9000. I’ve introduced quite a lot of MPLS terms in this lab. In a later post I will go through this topology again in detail, and talk through the MPLS specifics.